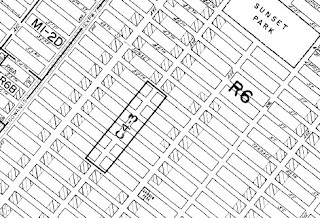 Sunset Park is among the many, many Brooklyn neighborhoods up for a rezoning, and City Planning will be making a presentation of its Sunset Park rezoning study this month. The big day is Thursday, March 13, and the presentation is scheduled for 6:30 PM in the office of Community Board 7, which is located at 4201 Fourth Avenue (43rd Street). Meetings and discussions about the rezoning have been going on for a long time. You can make all the laws you want. They mean absolutely nothing if the people paid to enforce them (DOB) will not do what they are paid to do. Even worse yet when they (DOB) in fact join forces with unscrupulous developers to violate the very laws that they are paid to enforce. I live in Sunset Park but am concerned about any rezoning because of what I have heard from friends in South Slope. It seems that the with the new zoning comes a rush by developers to get Grandfathered. The DOB does nothing to stop it. From what I understand that huge building on Prospect and 5th was allowed to be grandfathered even though they still don't have legal plans on file. So what's the use. Will New Williamsburg Be Edgy or Chainy? BREAKING: Red Hook Vendors Get 6-Year Permit!